Fundamental and applied research on nanoparticles focuses on their exceptional size and shape sensitive properties, which requires efficient synthesis routes to obtain large assemblies with a high dimension and shape monodispersity. Thanks to the nano-patterning of their surface properties, hybrid substrates made of ultra-thin oxide films grown a metal surface, are particularly promising templates for such synthesis. Via an international collaboration with two experimental groups and thanks to a simulation strategy involving an atomistic software developed at INSP, theorists of the team “Oxides in low dimensions” have identified the subtle interplay between electronic and elastic mechanisms responsible for the self-organization of metallic nanoparticles on MgO/Mo(100). The lattice mismatch between a magnesium oxide MgO(001) film and the (001) surface of molybdenum gives rise to a Moiré pattern of about 5 nm periodicity, as revealed by STM images (Fig. 1a). The combined use of an ab initio approach (VASP : Vienna Atomistic Simulation Package) and of an « order N » quantum method (PHFAST : Paris Hartree-Fock Atomistic Simulation Tool, developed by the team), has allowed to determine the atomic structure of the coincidence cell and to identify the association of electronic and elastic effects responsible for the nanostructuration (Fig. 2). On the one hand, interface misfit dislocations modulate the MgO film, with dilation/contraction of the lateral lattice parameter in regions of good ((d) in Fig.1) or bad ((a) and (b)) matching at the oxide/metal interface. On the other hand, the work function which is driven principally by the compression of the metal electronic density by the oxide film (and thus depends sensitively on the interfacial distance between both materials) is strongly reduced in regions of good matching (d) surrounded by misfit dislocations (regions (a) and (b)). (b) substrate covered with metallic particles ; in the insert : a Fourier transform evidencing the self-organization. Modulations of the electronic and structural characteristics of an MgO(001) trilayer on Mo(001) in the coincidence cell (5 nm x 5 nm) : (a) lattice distortion maps (elongated and contracted O-Mg distances are plotted in red and blue, respectively) in the three successive layers of the trilayer. (b) Variations of the Interfacial distance and local work function along the unit cell diagonal, from coincidence region (d) to (a). Our detailed analysis of the adsorption of metallic species has revealed the microscopic mechanisms responsible for the self-organization within the Moiré pattern (Figure 1 b). On one hand, nucleation of particles is favored in regions (a), where adatom bonding is reinforced by the high value of the local work function (Figure 3). On the other hand, due to an optimal matching between the particle and the hybrid substrate, the elastic strain favors the particle growth in regions (a). 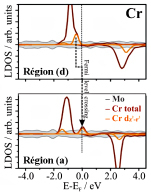 Density of states for a Cr atom adsorbed in regions (d) and (a) of the coincidence cell : Cr is positively charged in (a) as a consequence of the higher substrate work function. The anti-bonding dz2-r2 orbital gets partially depopulated, which reinforces adsorption. Thanks to their hybrid character, oxide/metal substrates allow a fine tuning of the patterning, by a judicious choice of the oxide/metal pair, of the orientation and of the thickness of the oxide layer. They constitute promising templates for a controlled self-organized nanoparticle growth in view of applications in magnetism, spintronics or catalysis. This work was performed in collaboration with experimentalists of the Fritz-Haber-Institut der Max-Planck-Gesellschaft in Berlin and of the Modena University, within the COST action CM1104 : « Reducible Oxide Chemistry, Structure, and Functions ».